Vinegar and booze might seem like an unlikely pair, but they go way, way back. Hundreds of years, in fact. Shrubs, derived from the Arabic word sharāb, meaning "to drink," were initially created as a kind of medicinal cordial, back in the days when people still believed alcohol was good for you (you're adorable, 15th century). In the late 1600s, the original shrub cocktail recipes contained no vinegar whatsoever—they were merely "acidulated beverages" with a high concentration of sugar, alcohol, and fruit. To avoid the high taxes imposed upon luxury imports like liquor from mainland Europe, smugglers sunk casks of alcohol off England's shores. Once the casks were furtively retrieved, the smugglers discovered that shrubs were the perfect solution to mask the foul flavor of the seawater-tainted booze. The sugary-sweet flavor worked, and the alcohol preserved the fruit, so shrubs were easy to keep on hand. This created a drink that was quite similar to punch, and the popularity of shrubs subsequently soared in public houses over the next 200 years (name one trend that's lasted that long—besides steak). How and where vinegar entered the equation is more of a mystery. Brilliantly employed—likely by an ingenious cook or a poor mother afraid of alcohol—it first appeared in 17th-century England as a way to preserve fruits in a pre-refrigeration era. Made with either fruit macerated with sugar plus wild yeasts from the air or on-hand vinegar, the shrub mixture would ferment and keep for months or even indefinitely. Fruits spoil. Vinegar does not. Eventually carried across the pond to the colonies, this drinking vinegar was made with fresh berries left to sit, and it was served with soda water or booze to be made as a cocktail. Dry and surprisingly refreshing, the bracing tartness lends a mouthwatering sweetness to drinks but is simultaneously savory. Shrubs are just one of those things you simply have to try in order to understand. And then, like a lot of other probably cool stuff, it fell out of fashion with the advent of refrigeration. But shrubs are coming back. Over the last few years, they've crept onto cocktail menus in springtime, when their base fruits are ripe for the shrubbing. Since they're tangy and add a layered complexity to drinks, they make a splendid substitute for fresh citrus juice, especially limes. Also, shrubs are kind of a gimmick. Today, bartenders are increasingly under pressure to craft original cocktails; playing with and modifying old traditions has become a trend in an effort to retain the attention of bar-goers. With the help of cocktail historians like David Wondrich, what's old is made new again, and bartenders will draw recipes, tricks, and inspiration from all available sources. 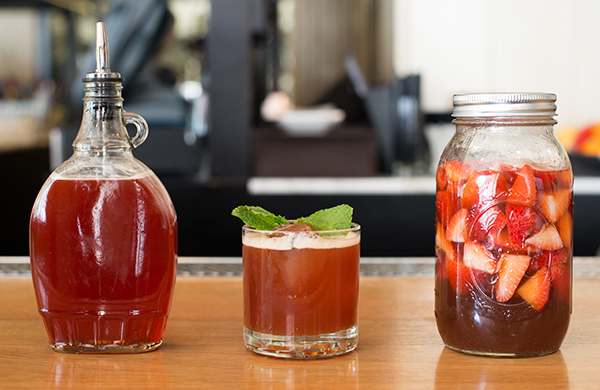 The ultra-easy-to-make strawberry shrub recipe (seen below) is jammy and sweet, with a tart finish that will mellow over time if left to sit. Oh yeah, and it'll live forever. Stash some in the back of your fridge to the delight of anyone who comes over for a tipple, or just keep it all to yourself. Experimenting with various vinegars will yield different results in sweetness, acidity, and complexity—same goes for the fruit, though more acidic fruits will prove more of a challenge. Stick with berries or stone fruits, and use equal parts fruit, sugar, and vinegar (or try mixing multiple vinegars for added tangy excitement). From her outpost at Chicago's GT Fish & Oyster, Lewis said she went exploring in the kitchen when she started experimenting with shrubs. For this recipe, she uses equal parts everything—a half-part of each vinegar—and lets the strawberry-vinegar mixture sit for about four days before adding the sugar. Put the cut strawberries in a large jar. Heat the vinegars, but don't let them boil. Pour the vinegars over the strawberries, seal, and let sit for at least four days at room temperature. Once the fruit has lost most of its color, pour into a pan and heat on medium-low. Add sugar, stir, and strain back into jar. Refrigerate indefinitely. The flavor will change, so be sure to try it before adding to cocktails, as it'll lose some of its vinegar acidity over time. Build all components in a cocktail shaker over ice. Shake vigorously for 10–15 seconds, and strain into a rocks glass over a large ice cube (a sphere, if possible.) Garnish with a fresh sprig of mint (slap the mint between your palms to release fragrant oils), and serve.